An example where the default integral symbol doesn't look ok. Problem description: default integral symbol doesn't look good with two or more lines height integrands. Current behavior: default integral symbol looks 'out placed'. Too small for such a high integrand. Expected behavior: as in the case of brackets, include a scalable integral symbol that can adjust to two-or-more-line-height integrands. Something similar should be done with integral, product, sum, etc. signs. I think the behaviour showed in your last attachment is in the right direction. I only have three questions. 1) Have you done a modification to the code, or it is only a mockup? 2) Some people have argued that, in professional documents, mathematical operators should always have the same size. So, they think these operators shouldn't be adjustable to the respective operand size. For those that think this way, is there a method to leave the operator size unchanged? 3) If you look at the adjusted product operand, don't you think that it sholud be wider? It's only a personal appreciation, but I feel it too 'narrow'. Finally, thank you very much for your efforts. Mockup or a real intervention to the code, it's the first time I see somebody working to improve this feature in Math. I hope to see good news in a future release. > direction. I only have three questions. > 1) Have you done a modification to the code, or it is only a mockup? > this way, is there a method to leave the operator size unchanged? > feature in Math. I hope to see good news in a future release. 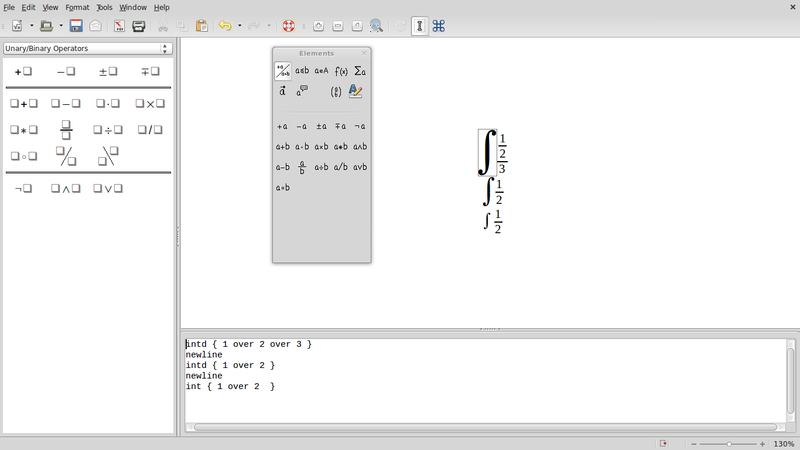 1) Yes, I have modified the code, and I have uploaded to the gerrit.libreoffice.org. 2) I have not thought this question yet, but I think we can modify the code to do, what you aks. 3)Not just the product the 'narrow', just you can see better in this symbol the narrow. This function is the responsible for the size. But I commented it, because with this we can not do the height. Also it was responsible for the wide too. > > direction. I only have three questions. > > 1) Have you done a modification to the code, or it is only a mockup? > > this way, is there a method to leave the operator size unchanged? > > feature in Math. I hope to see good news in a future release. > First of all, sorry my bad english. > to do, what you aks. > with this we can not do the height. Also it was responsible for the wide too. First of all, don't worry about your english. I'm from Chile, so I'm not a native English-speaker, and (therefore) probably will make mistakes too. 1) It's amazing. It means that we'll probably see another Math improvement. It's great! 2) Last time, I didn't remember where I read that observation, but today I found the place: https://issues.apache.org/ooo/show_bug.cgi?id=26048 (comment number 2, by thomas.lange). This is the reason for which I think that providing a way to leave the operator size unchanged, would be a good idea (the more flexible the tool is, the best it will be for L.O Math). Maybe, a nice idea would be to create a specific command for a 'scalable' operator, and keep using the current 'int', 'sum', 'prod' commands for 'non-scalable' operators (just like L.O. Math currently handles 'scalable' and 'non-scalable' parentheses/brackets). 3) Sorry, but I did'n understand what you meant by 'not just the product the narrow'. Maybe it's my fault, I probably didn't express my idea in a right way. I only want to clarify something: when I told that the product operator seems a little bit 'narrow' to me, I didn't express my opinion about the thikness of the 'stroke/line' that is being used to draw the operator. Instead, I was talking about the 'horizontal space' that the whole operator takes up in the resulting formula. 4) Why the integral symbol in your last attachment is so 'fat'? Finally, thank you very (really, VERY) much for spending your time working on this issue. Hi everybody, I was planning to put hands on this issue as my first time hacking L.O..
- Reading past discussion, it seems to me that there is some agreement on the fact that dynamically-sized integrals/sums/products/etc. should be given as a command additional to "int" & C.. In other words, dynamic size should be optional. Is that correct? - There seems to be some work done by Véghelyi András in the past (see previous commments in this issue). That code may possibly be a good starting point. I'm not familiar at all with Gerrit and the rest of the patch/merge workflow in L.O., but is this code available anywhere? Was it integrated at the time in L.O.? Or, how could I check such a thing? Comments of any kind are very appreciated. > be optional. Is that correct? > in L.O.? Or, how could I check such a thing? > Comments of any kind are very appreciated. About your first point, my humble opinion is that dynamic size should be optional (some people think that different instances of the same operator, belonging to the same line, should not have different sizes; despite of the size of their operands. Check https://issues.apache.org/ooo/show_bug.cgi?id=45511 for details). I have no information about your questions in your second point. so I worked a little on dynamically-sized integrals and I have something working. I added a new command "intd" for the purpose. An user can still use the old "int" to have the usual effect. The picture at the URL below shows how the integral sign with "intd" resizes according to its body argument. Notice that the last line is an ordinary "int" and is there for comparison purposes. The code I currently have should be easily adapted to sum, products and so forth. matteocam committed a patch related to this issue. fdo#53472 Created Dynamic Integral Node classes. Integrals size made dependent on body. I made the export process(export CPPUNITTRACE="gdb --args"). warning: File "/home/melike/libreoffice/instdir/program/libuno_sal.so.3-gdb.py" auto-loading has been declined by your `auto-load safe-path' set to "$debugdir:$datadir/auto-load". line to your configuration file "/home/melike/.gdbinit". warning: File "/home/melike/libreoffice/instdir/program/libuno_cppu.so.3-gdb.py" auto-loading has been declined by your `auto-load safe-path' set to "$debugdir:$datadir/auto-load". warning: File "/home/melike/libreoffice/instdir/program/libtllo.so-gdb.py" auto-loading has been declined by your `auto-load safe-path' set to "$debugdir:$datadir/auto-load". warning: File "/home/melike/libreoffice/instdir/program/libbasegfxlo.so-gdb.py" auto-loading has been declined by your `auto-load safe-path' set to "$debugdir:$datadir/auto-load". warning: File "/home/melike/libreoffice/instdir/program/libsvllo.so-gdb.py" auto-loading has been declined by your `auto-load safe-path' set to "$debugdir:$datadir/auto-load". I have no idea about what I should do.Could you please can you give me your opinion? The attached file contains some test cases. It was last save with version 5.2, which has commit id=746633bd0315939fd5e0b50c90692d356d2ed678 included. So the preview images show the errors. When you use this file to test a new version, you have to double-click each formula object to refresh it and you have to use "Original size" on the object, to get the correct ratio. Please notice, that the attempt "intd" and the attempt by melikeyurtoglu interfere, because the attempt "intd" assumes, that non stretchy integral operators are written as "int". Both attempts do not consider, that MathML 2.0 is the normative language for  formulas in ODF and therefore the MathML attribute "stretchy" should to be considered. I don't think, that this problem on the whole is an "easyHack".